WHERE YOU CAN SEE THEM: All over Malaysia and Indonesia, in the wild or at a rehabilitation center. The word “orangutan” means “man of the forest” in the Malay language… which makes sense when you consider that orangutans share 96.4% of our genes. They have grasping hands at the end of long arms, which allows them to swing through trees from branch to branch. They can grow to be between 1.25 and 1.5 metres tall; females weigh in at 30-50kg, and males at 50-90kg. 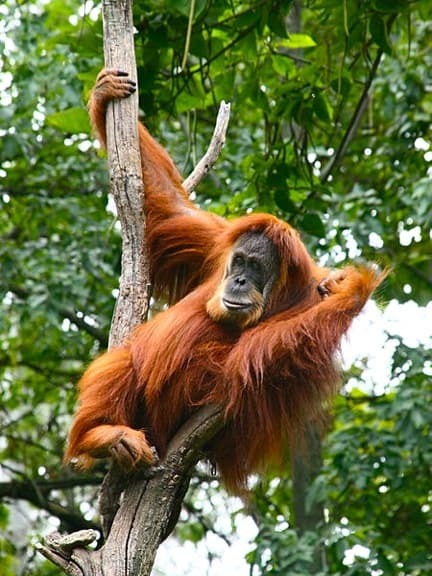 We can easily identify orangutans by their red hair, but another distinguishing physical feature in males can be specified as “flanged” or “unflanged.” The flanged males have prominent cheek pads and a throat sack for long calls, whereas the unflanged orangutans do not have such features. They eat wild fruits such as lychees, mangosteens, and figs, and extract water from holes in trees by slurping it up. The biggest threat to the orangutans’ population is deforestation. Palm oil is an edible oil extracted from trees that’s found in many food products, and is starting to be used as a biofuel. The forest in Indonesia is rapidly being cleared to make room for palm oil plantations, thus decreasing the orangutan’s habitat. The apes are also a target for poachers, in particular the females with babies, as the young offspring are often kept as pets. They’re mostly taken to Taiwan for this purpose, but conservationists say that for every animal that successfully makes it to Taiwan, 3-5 other animals die during transportation. These factors have led to a 50% decrease in orangutan population over the last 60 years. 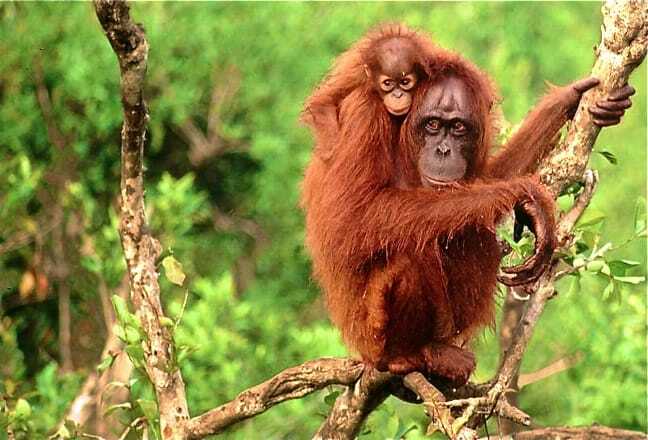 There are thought to be 41,000 Bornean orangutans and 7,500 Sumatran orangutans left in the wild today.